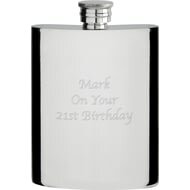 Presented in a black gift box this 5oz hipflask can be engraved with a message of your choice, perfect as a gift for someone who likes a drink or two. 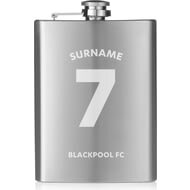 One of our best-selling Blackpool FC gifts, this 8oz hipflask is a fabulous present for any Blackpool FC football fan. 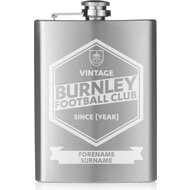 One of our best-selling Burnley FC gifts, this 8oz hipflask is a fabulous present for any Burnley FC football fan. 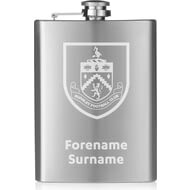 This truly stunning engraved hipflask is a fabulous present for any Burnley FC fan and is an approved and fully licensed product. This truly stunning engraved hipflask is a fabulous present for any Burnley FC fan. One of our best-selling Brentford FC gifts, this 8oz hipflask is a fabulous present for any Brentford FC football fan. 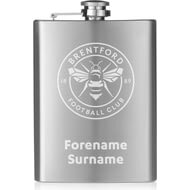 This truly stunning engraved hipflask is a fabulous present for any Brentford FC fan. One of our best-selling Bolton Wanderers FC gifts, this 8oz hipflask is a fabulous present for any Bolton Wanderers FC football fan. 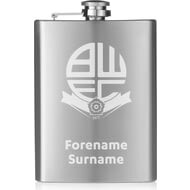 This truly stunning engraved hipflask is a fabulous present for any Bolton Wanderers FC fan. One of our best-selling Bury FC gifts, this 8oz hipflask is a fabulous present for any Bury FC football fan. This truly stunning engraved hipflask is a fabulous present for any Bury FC fan. One of our best-selling Cardiff City FC gifts, this 8oz hipflask is a fabulous present for any Cardiff City FC football fan. 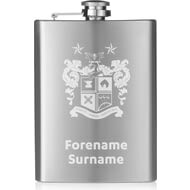 This truly stunning engraved hipflask is a fabulous present for any Cardiff City FC fan and is an approved and fully licensed product. 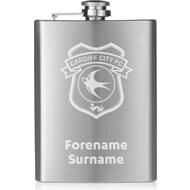 This truly stunning engraved hipflask is a fabulous present for any Cardiff City FC fan. One of our best-selling Chelsea FC gifts, this 8oz hipflask is a fabulous present for any Chelsea FC football fan. This truly stunning engraved hipflask is a fabulous present for any Chelsea FC fan and is an approved and fully licensed product. 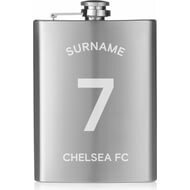 This truly stunning engraved hipflask is a fabulous present for any Chelsea FC fan. 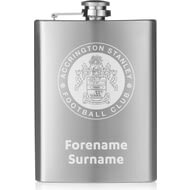 One of our best-selling Accrington Stanley gifts, this 8oz hipflask is a fabulous present for any Accrington Stanley football fan. 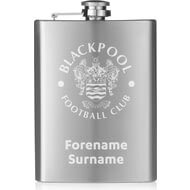 This truly stunning engraved hipflask is a fabulous present for any Accrington Stanley fan. 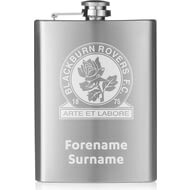 This truly stunning engraved hipflask is a fabulous present for any Blackburn Rovers FC fan. 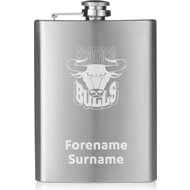 One of our best-selling Bradford Bulls gifts, this 8oz hipflask is a fabulous present for any Bradford Bulls football fan. This truly stunning engraved hipflask is a fabulous present for any Bradford Bulls fan. One of our best-selling Brighton & Hove Albion FC gifts, this 8oz hipflask is a fabulous present for any Brighton & Hove Albion FC fan. This truly stunning engraved hipflask is a fabulous present for any Brighton & Hove Albion FC fan and is an approved and fully licensed product. This truly stunning engraved hipflask is a fabulous present for any Brighton & Hove Albion FC fan. One of our best-selling Birmingham City FC gifts, this 8oz hipflask is a fabulous present for any Birmingham City FC football fan. 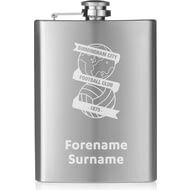 This truly stunning engraved hipflask is a fabulous present for any Birmingham City FC fan and is an approved and fully licensed product. This truly stunning engraved hipflask is a fabulous present for any Birmingham City FC fan. One of our best-selling AFC Bournemouth gifts, this 8oz hipflask is a fabulous present for any AFC Bournemouth football fan. 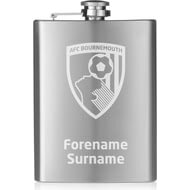 This truly stunning engraved hipflask is a fabulous present for any AFC Bournemouth fan and is an approved and fully licensed product. This truly stunning engraved hipflask is a fabulous present for any AFC Bournemouth fan.